Ants aren’t pests, except during an outdoor meal. They are “ecosystem engineers,” as University of Exeter researchers dubbed them. As the Bible says, “Go to the ant, you sluggard — observe its ways and be wise.” That’s good advice whether you’re a believer or not. Ants are found everywhere on Earth. There are roughly 12,000 species, although more are discovered all the time. The majority of species live in rainforests and other hot climates. Ants are an integral part of the environment, and most plant species could not survive without them. Of course, there are some species — such are fire ants — that don’t play well with others. Ants live in colonies. That ant hill in your yard isn’t the colony itself — it’s merely an entrance. The actual ant colony reaches deep underground, and consists of tunnels and nesting chambers. The mound consists of the dirt removed as the ant workers constructed these vast underground networks. Ants are the original feminists. The colony revolves around its queen. She lives deep within a colony, safe from predators. A queen ant can live for years, unlike the other ants with typical seasonal insect lifespans. The queen mates with drones, and populates the colony by laying thousands of eggs. Mating is the drone’s sole function — they die soon afterward. The worker ants, the ones invading your picnic or found anywhere outside the colony, are females. They don’t lay eggs, but are responsible for the complete building and upkeep of the colony, including supplying food. The lifespan of the colony all rests on the queen, and that varies between species. Ants actually created most of the topsoil in much of Canada and the northern parts of the United States, where there are no native earthworms. Ants tunnel soil in much the same manner as earthworms — breaking, churning and aerating the dirt. If you have a lot of ants in your garden, that’s generally an indicator of good soil health. Ants disperse seeds, especially those of flowering plants. If you enjoy a field of wildflowers, thank the ants. Ants are tiny, and trees are huge, but the latter depend on the former throughout their life cycle. As seedlings, trees thrive in the compost created by ants. Their waste products continue to enrich the soil. 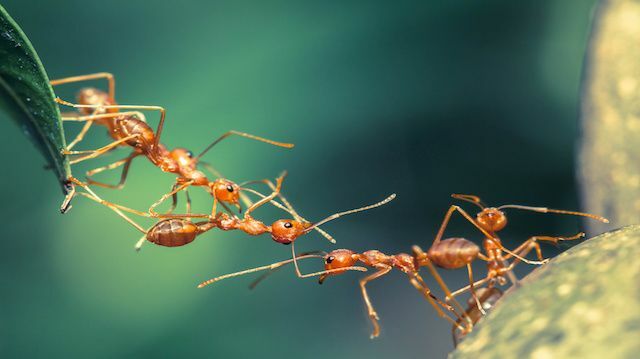 In the tropics, ants and certain trees have a codependent relationship, where the native ants actually form colonies in the hollow stems of a tree’s thorns. The trees secrete sugars, an ant’s favorite food. While this codependence is not as obvious in temperate climates, ants benefit trees by ingesting tent caterpillars, gypsy moths and other tree-killing larvae. As the tree gets older, carpenter ants come into the cycle, feeding off the decaying wood. You’ll notice sawdust at the base of a tree that harbors carpenter ants — or in an area of a house they’ve invaded. In the latter case, contact an exterminator. Eventually, the dead tree falls. Soil-nesting ants will feed on it, returning nutrients to the soil from which a seedling will emerge. Ants eat the pests that harm crops. Aphids are a favorite snack. Without ants, aphids would destroy any plant they live on. Ants ingest newly hatched flies, cutting down the number of these disease vectors considerably. They’ll also consume cockroaches, bed bugs, silverfish and other unwanted creatures. Ants act as a unit to bring down larger predators, especially herbivores that might destroy your garden. Ants protect the larvae of beneficial insects, such as the caterpillar larvae that turn into butterflies. Ants are territorial and will fight to the death to keep what they register as theirs. Hey Buddy!, I found this information for you: "What I Like About Ants". Here is the website link: https://www.thealternativedaily.com/what-i-like-about-ants/. Thank you.